A Fun Way to Keep the Carousel Turning! Adopt a piece of the Carousel! You can adopt the animals and the rounding boards for one or more years, or consider a permanent adoption of an Angel Memorial Mirror. Our adoption program is explained below. > See Availability Here, of animals, rounding boards, and angel mirrors. > Ready to Adopt? Make a payment here. Leave a memo about what you wish to adopt. 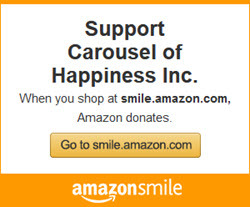 > Contact the Carousel with any questions: call 303-258-3457, or email outreach@carouselofhappiness.org. $750 a year, $500 to renew each year. We make a plaque inscribed with your text, which is placed next to your animal. You get a 10-ride gift card, and other carousel mementos from our store. We will celebrate your adoption on our Facebook page. These painted, basswood animals were carved by Scott Harrison from 1986-2006. $250 a year, $200 to renew each year. We make a plaque inscribed with your text, which is placed next to your painting. You will get a small collection of carousel mementos from our store. Painted in 1910 by German immigrant, August Wolfinger, for the Silver Beach Amusement Park, St. Joseph, Missouri. These paintings of endangered animals were created by Russian immigrant, Vladimir V. ca. 1990s. The person who carved these mirrors, is unknown. Scott Harrison finished and painted each one.